After an extreme amount of dithering, I settled upon the easy as pie scarf as my complicated scarf – a not too hard combination of lace and cables, but I think sufficiently hard for me. 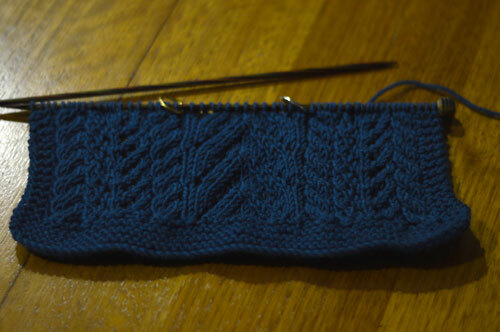 In the spirit of using of what I have, I’m knitting with the yarn from the abandoned boxy jumper. I must admit I was extremely tempted this morning by the vintage Shetland baby shawl patterns on kate davies blog. Thankfully there are no babies on the horizon, but I think such a thing would be a quite excellent throw for the kitties to claw to bits! I think we’ll see how I go with the scarf first!